Reeve LeClaire looks like a typical 22-year-old girl, but she is anything but normal. Ten years ago, she was kidnapped and held captive for four years. After a lucky escape, she’s been rebuilding her life, thanks in large part to her therapist Dr. Ezra Lerner. When he asks Reeve to help mentor another girl rescued from a similar ordeal, the two bond very quickly. But the more Tilly confides in her, Reeve realizes she may not simply need to support this young survivor, but that she may be the only one who can protect her from a cunning predator who is still out there, watching her every move. I received a free copy of this novel in exchange for an honest review. "The Edge Of Normal" is an amazing story of strength, courage, and perseverance. Reeve LeClaire has been through quite a lot in her short twenty two years of life. She was kidnapped and held captive when she was 12 years old, and by chance was found about 3 years later. She was traumatized, raped and abused. Now another young girl has been found. Will Reeve fight her demons to help this young girl heal? This book put me on an emotional rollercoaster. The descriptions were so vivid, it was like reliving the story in your mind's eye. You see the main character grow from victim to survivor, and her emotions move from fear to anger as she becomes determined to find the other two missing girls. I was completely engrossed from start to finish as I wondered if they would realize who the kidnapper actually was. This was a great book with edge of your seat excitement, a must read for every crime thriller fan! Carla is the author of the #1 New York Times bestseller Perfect Victim: The True Story of the Girl in the Box, which the FBI put on their Behavioral Sciences Unit reading list. She served as the special sections editor for the San Jose Mercury News and has written for numerous publications. She has an MFA from Goddard College and has twice served as a judge for the Edgar Awards. 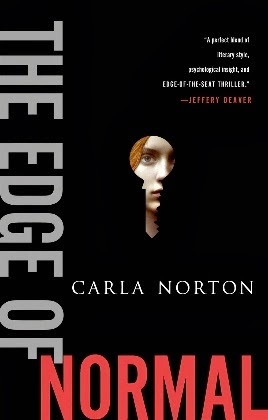 The Edge of Normal, which won a Royal Palm Literary Award for best unpublished mystery, is her debut novel. She lives in California and Florida.